A community organizes against his library plans. 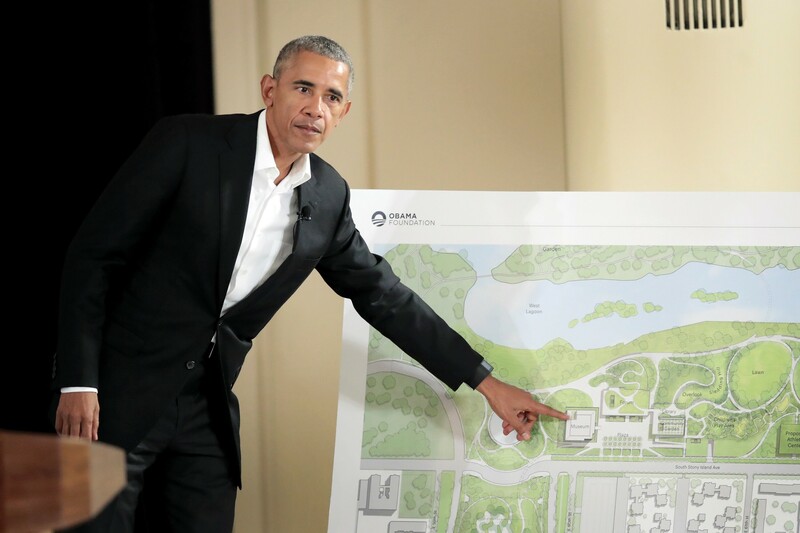 In Barack Obama’s adopted hometown, of all places, his $375 million Obama Presidential Center is running into growing headwinds from a few gutsy souls. Ironically, the winds aren’t gusting from the usual direction—Republicans and others the left often labels racist Obama-haters. Rather, it’s blowing from the very people who have long lionized Obama: white Chicago lakefront progressives, University of Chicago professors, environmentalists, African-American activists, and a community organization of the kind that once employed Obama as an organizer. On May 14, a preservationist group called Protect Our Parks filed a lawsuit in U.S. District Court in Chicago, seeking a court order that would bar local government agencies from building Obama’s center in the revered and beautiful Jackson Park, which served as the site of the Chicago World’s Fair in 1893. The group also wants to bar the city from giving control of the center’s site to the Obama Foundation. They are opposed by a phalanx of avid Obama supporters headed by Chicago mayor Rahm Emanuel and including local labor unions, businesses, newspaper editorial boards, and a range of do-gooders who have uncritically embraced Obama’s library plans.